In two weeks’ time, I’m going to spend the afternoon with my childhood best friend. We haven’t seen each other in - I hate to say how long - 42 years, if I’m counting correctly. We’ve been able to keep track of each other all these years because our parents were friends. In fact, when my dad died in 2006, Sharyn’s father sat next to me at the funeral, holding my hand. I have lots of memories of Sharyn - her bronze patent leather Capezios for Easter Sunday; her New Year’s Eve birthday; trick or treating in the snow after an early winter storm; taking tap dancing lessons together. 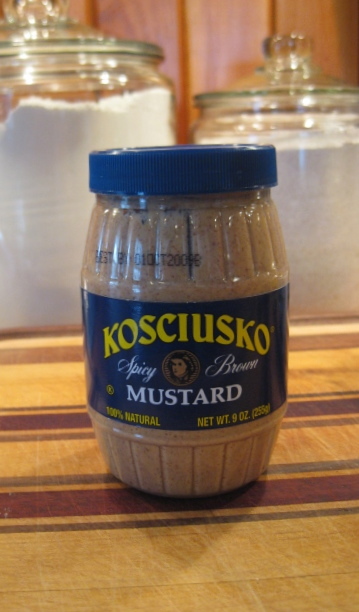 I never pick up a jar of Kosciusko Mustard without thinking of her because I remember how much she liked it. The big question now is where should we go to lunch? We can’t go to Pearl Oyster Bar. Sharyn’s from Maine, so taking her to a restaurant in New York City that is modeled after a Maine lobster shack would be rather ridiculous, even if Rebecca Charles’s salt crusted shrimp is one of the best things to eat in the world. Should we go to The Four Seasons because it’s fancy? Swifty’s because Jane recommended it? Brio because the Italian food is so good tourists from Italy eat there? Girasole because it’s in my neighborhood? The Lincoln because it’s hot? The Lexington Candy Shop with its old fashioned soda fountain because it’s fun? Ah ha. The Trustee’s Dining Room at The Metropolitan Museum. The food is excellent, the room is comfortable, the view is lovely, and we can talk without interruption. After lunch if it’s a nasty day, we can wander around the Museum; if it’s nice, the Park. Then we can go back to my apartment and have a cup of tea (everybody drinks tea, right?) and a piece of this plain, not-too-sweet but lovely cake before Sharyn meets Doug for a dinner where he is the guest speaker. This cake is just the ticket for a restorative afternoon snack. It’s adapted from Around My French Table by Dorie Greenspan - the creator of World Peace Cookies , which, I believe, would get democrats and republicans working together if someone would just make a lot of them and lug them to Congress. Butter an 8-inch springform pan. In a small bowl stir the flour, baking powder, and salt together with a fork. Peel the apples. Cut them in half, and cut four large pieces off around the apple, leaving just the cores, which you will discard. I find this easier than using an apple corer. Cut the pieces into chunks, about an inch big. A little larger than an inch is fine. Break the eggs into a large bowl, and beat them with a whisk until they foam a little. Add the sugar, whisk to blend, then whisk in the rum and vanilla. Add half the flour and whisk until incorporated, then whisk in half the melted butter. Repeat this step by whisking in the other half of the flour followed by the rest of the melted butter, and mix until the batter is smooth and thick. Using a rubber or silicone spatula, fold in the apples, turning until the fruit is coated with batter. You will find there are more apples than batter; this is how it’s supposed to be. Scrape the mixture into the buttered springform pan, and spread it around with the spatula until it’s as even as you can get it. It won’t be perfect because there are so many apples. Put a piece of parchment on a baking sheet - I use a half sheet pan - and put the springform pan on it. Slide the baking sheet with the springform pan on it into the oven. Bake until the top of the cake is golden brown and a knife or cake tester inserted into the center comes out clean. This will take about 50 to 60 minutes. Transfer the cake to a cooling rack, and leave it for 5 minutes. Run a blunt knife around the edge of the cake. This should be easy as the cake will probably have already pulled away from the sides of the pan, but still be sure to open the springform pan slowly to make sure no apples have stuck to the sides. It may be eaten warm or at room temperature and is particularly delicious with some lightly whipped cream with a little sugar and rum in it. The cake should keep well for 2 days, but do not cover it. You can put a strip of wax paper on the cut ends. - Oh, oh, oh. There are so many things to comment on, I don't know where to start! First, hello and happy New Year. I'm so excited to see a new post. Next, how thrilling to meet up with someone after so much time has passed. I am filled with eager anticipation for you, and for the story! And last, well, the cake of course! I am dying to try this! I got a copy of Around my French Table in late fall, and I haven't tried any of the sweet recipes yet... Only the savory. Now, I simply must. It's so wonderful to read your words again, Victoria! Why do your posts always make me more warm and fuzzy?? I clicked here from :Pastry Studio to read where you are located, being in Maine myself and often more than green with envy about all the stone fruit desserts posted there. I just spent a portion of a day with my best friend from childhood, whom I haven't seen for at least 30 years, as a result of the death of her father 45 yeas after the unexpected and tragic death of her mother. Because her birthday each year is one of "my" birthdays, and because she hasn't moved for about that same period of time, we've kept in touch, with one or the other of us calling to wish a happy one. I was honored when she said that I was one of the two people who made her weep when we met at the shiva for her dad. And I would definitely take a friend such as Judy to lunch at the Metropolitan. Great choice, and lovely cake recipe; though I was looking to find out more about you than your blog, I'll return to see more about your recipes again. I have never seen an apple cake with big nice pieces like that. Yummy! My mouth is watering. My husband and I met you in early June while dining on lunch at Les Halles. Thank you for your suggestions of places to visit. We had a lovely time in NYC. Your blog is great. I know I'll enjoy reading your recipes and trying them out.